The up and coming producer team from Cologne, Germany teams up with Vienna's finest on Personal Records for the 7-inch release of ''New High'' and ''Try.'' 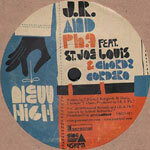 On this two song single JR&PH7 collaborate with two New Jersey hip hop groups St. Joe Louis and Brokn Englsh. On the deep atmospheric beat of New High, St. Joe Louis display lyrical sharpness as they address the highs and lows of relationship life. A more uptempo and percussion driven instrumental gets the three emcees of Brokn Englsh busy on the flip side.